Jason Gillespie has revealed the coaching philosophy he hopes will carry Sussex to cricketing success this summer. The Australian legend has been quick to make himself at home in the county and has impressed everyone he has encountered at the County Ground with his down-to-earth manner and positive outlook. He said he would be trying to get his squad – especially the many young players in it – to learn something from every day of cricket they played, and learn from everybody they met. And he said he was all for giving local talent a chance to shine in the team. Asked how he kept on top of the coaching game, the man who led Yorkshire to two county championship titles said: “I think having an open mind is key. If you think you know it all you’re in a little bit of strife. You can draw inspiration in whatever you do from all sorts of things. “I like to look to all sorts of people, whether they’re involved in sport or not, the bloke down the pub, whatever. I’m a people person. I like to look to people and get ideas on the world and ask ‘does it relate back to sport and can I learn something here?’. 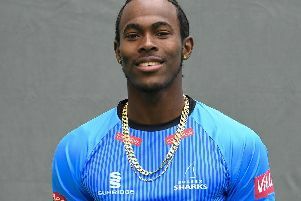 Gillespie plans to give Sussex-based talent plenty of chance to shine on the county stage, which will be music to the ears to the many youngsters trying to force their way into the first-team reckoning at Hove in any of the formats of the game. He added: “We’ll certainly be looking to give as many opportunities as we can to lads. I’ve never really understood why counties and state sides would have an academy if you wouldn’t then challenge those lads to move up the grades and look to play and force their way into the first team. “I loved playing, I really enjoyed it. Ever since I was six I wanted to play cricket for my country and I was fortunate enough to do that. I was fortunate enough to play for my state and I loved playing county cricket. I loved playing the game. “But the day I retired I moved on. I was ready to go on to other thinggs. I’ve had as much enjoyment out of coaching and seeing players achieve their goals and dreams and having success. I’ve had as much enjoyment out of that as I’ve had as a player. The two are different. I’m not going to say one’s better than the other.